If you own your own home maintenance and home improvements can become a problem as you get older. If you are planning to downsize your life it is important that you consider carefully the maintenance and improvements of whatever property you intend to retire to. You may well have been a keen do it yourself person in the past and carried out all your own home improvements. However you must realise that there will come a time when you may not be able to do as much as you could in your youth. 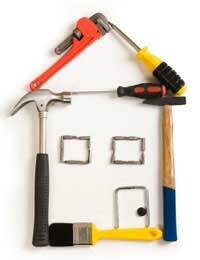 Have you budgeted for home maintenance in your downsizing plans? It may be that you will need to use the services of a builder, this can be expensive. Why not keep aside a certain amount of money when downsizing just in case you need to carry out home repairs? When downsizing it may be that you purchase a property in need of renovation. In itself this is a good idea as the property can only increase in value as you carry out the home improvements. However, it may become impossible to finish this work due to frail health or lack of funds. Ideally you should finish all home improvements and repairs before you downsize your job. This will leave you to enjoy your downsized lifestyle and not worry about home maintenance. Decorating your home can be a pleasant past time and very satisfying but as you get older you may not be able to quite reach the top of high walls or paint the ceilings. Do you have a family member or a friend who would take on these tasks for you? Perhaps you could trade skills? You may be good at baking or woodwork and can barter with someone for their decorating skills. If you cannot face a future of home improvements and home maintenance why not consider purchasing an apartment or bungalow within a complex? With a warden on site you can enjoy living in your own home but have the reassurance that someone is at hand if a problem should arise. Quite often these complexes have a handy man who can carry out all maintenance jobs saving you the worry of how to do them yourself. If you are already having problems with the maintenance of your home speak to your local Age Concern office as they will have a list of reliable workmen. They can also give you details of grants available for heating, insulation and other home improvements from your local council. Most towns have a volunteer bureau where you could ask for help with your gardening and decorating. In return you may be able to offer your own skills as a volunteer. If you are having problems looking after your home speak to your family. They may be able to help out with maintenance of the property or perhaps invite you to live in their home where you would be closer to your children and grandchildren and free from having to worry about home improvements and home maintenance ever again.